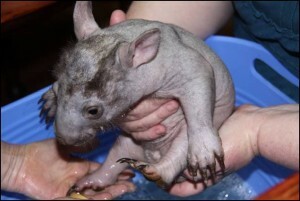 Wombats can develop skin conditions at any stage of their development. Has the orphan been exposed to harsh weather conditions? Severe cold weather, wet grass can cause skin irritation or in extreme cases frost bite. 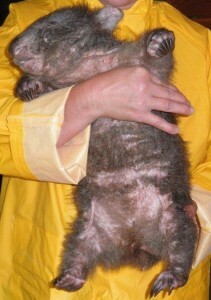 Is it something the wombat is coming in contact with? Bedding washed in certain types of washing powder can cause skin irritation due to the chemicals and perfumes added. 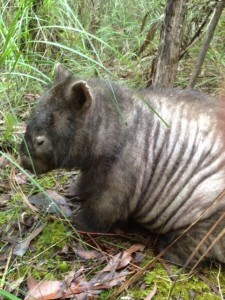 Or maybe there is something in the enclosure that is causing an allergic reaction. For example certain grasses, creepers, plants, dusty environment, dirty bedding (straw). Something the joey might find in the house hold cupboards (dry pet food, detergents, etc). 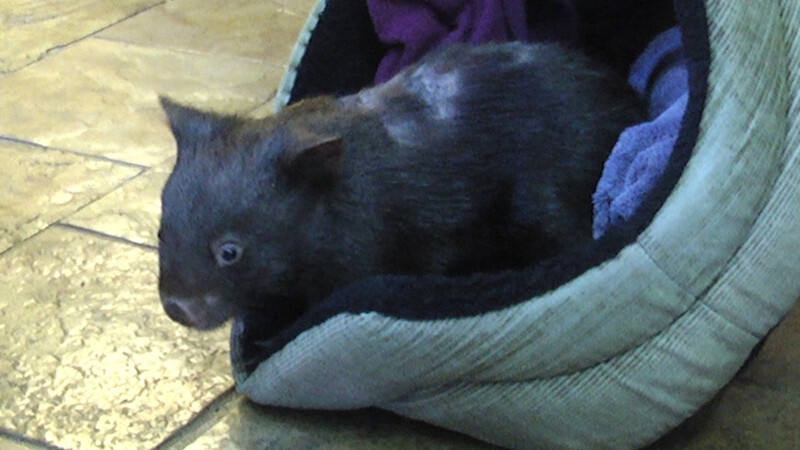 SHREK’S STORY This little wombat was named Shrek because when his skin was checked under an ultra violet light he glowed green and of course he had those Shrek ears. Shrek had been cared for by a well meaning member of the public for over a month before it was realized there was something wrong. In that time he was only fed grass and muesli, no milk. He was inappropriately housed with only an old cardigan in the corner of the kitchen floor to sleep on. 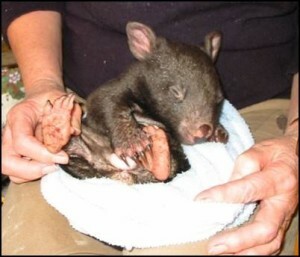 This would have been extremely stressful for a little wombat of this size. Consequently, he lost half his body weight and most of his hair had fallen out. 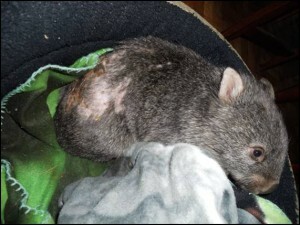 It was at this stage he was taken to a vet who immediately realized this little wombat was suffering from a fungal infection brought on by stress due to poor diet and housing. 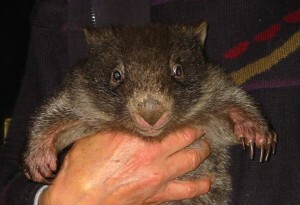 Fortunately he was surrendered and given to a registered wildlife shelter who specialized in wombats. 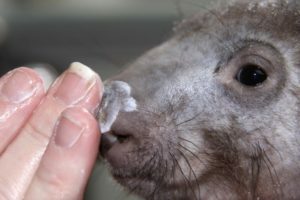 After a few weeks of TLC combined with lots of wombat milk, a warm pouch to call his own, special fungal cream for his skin and twice weekly baths in Malaseb Medicated Foam he started to recover. 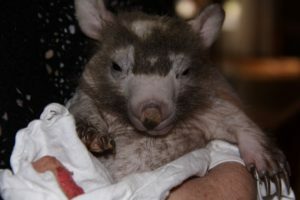 Shrek’s hair soon grew back and he began to put on weight and after a few weeks he was buddied with two other wombats of similar size. 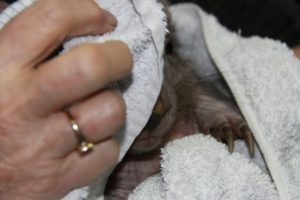 With the reassurance and company of buddies Scarlett and Rosie he developed into a confident little wombat and has since been successfully released. 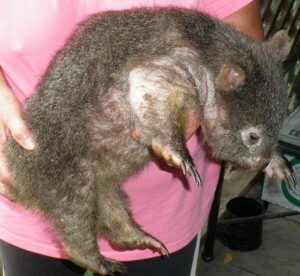 Shrek a couple of weeks later with a full tummy and his skin starting to feel better. This is often diagnosed as mange. Caused by exposure to cold wet grass, wet burrows, cold winds and freezing temperatures. 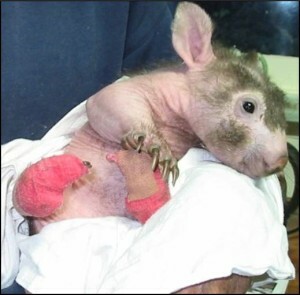 Often skin rashes are diagnosed as mange and this needs to be ruled out. 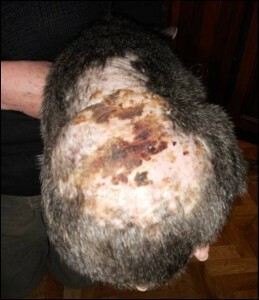 Mange is not a disease, it is an infestation of the mange mite which burrows under the skin. There are various ways to treat mange. The sooner treatment is started the better the outcome.